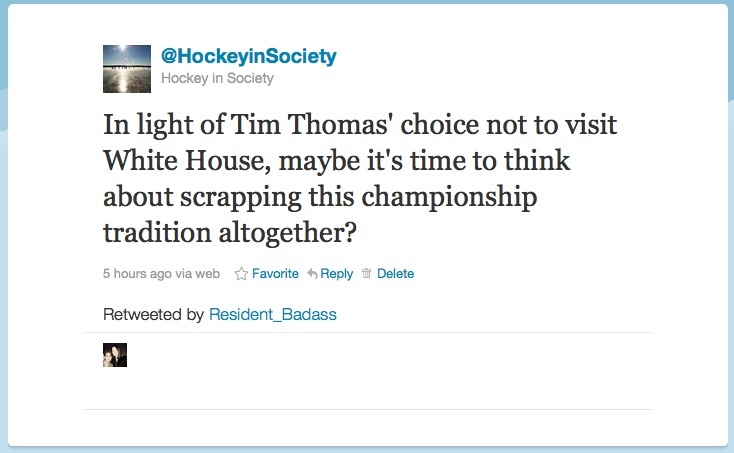 Mixing Politics and Hockey: Should Tim Thomas be Condemned for Declining President Obama’s Invitation to Visit the White House? It is an annual tradition that various US-based championship teams get invited by the President to visit the White House to be honoured for their accomplishments. I am not certain how far back this practice dates, but at least can confirm that it was already an established tradition as early as 1985. Usually these visits are jovial and non-confrontational affairs, with the height of controversy usually peaking with President Obama cracking jokes about the superiority of Chicago sports teams. That being said, as Greg Wyshynksi noted on Puck Daddy earlier today, the President does sometimes get snubbed by athletes. Obama, for example, has for various reasons had a retired and current NFL player and a number of NASCAR drivers turn down invitations to visit the White House. After some back and forth with some Twitter users who disagreed, I realized that I need to more fully explore this question given that my subsequent tweets were vague and I feel that Twitter is too brief a medium to fully explain my thoughts on this issue. Ultimately to me, the answer to this hinges on the answer to one key question: are the visits of athletes to the White House political (or partisan) acts? After the jump, I explore this issue in more depth. Good on Thomas for using this moment — where a professional sports team participates in what’s both an honor for its accomplishments and a political photo opportunity — to make a political statement of his own. . . . So what do we make of Thomas’ bold political statement? Is Thomas insulting the Office of the President by refusing to visit Obama? Or is he an American patriot who is willing to take a strong moral/political stand for what he believes in? This is where I return to my initial question: is the celebration of sports championships at the White House a political act? As a sociologist I would instinctively say yes, because my definition of what is political is considerably wider than that of many people and I therefore see sports as very much wrapped up in broader social, political, and economic issues (as regular readers may have picked up on by now!). But for this discussion I am willing to (at least temporarily) leave aside the ideological implications of the NHL and the sport of hockey in order to more clearly focus on this particular episode. So perhaps I should rephrase the question: are these White House visits partisan acts? The reason I think this question matters is because it completely alters how one views Thomas’ decision. As a Canucks fan I am not particularly fond of Thomas (for obvious reasons) and as a left-leaning individual I do not agree with his politics. However, if the visit of Stanley Cup champions to the White House has partisan overtones – inasmuch as it is a publicity event designed to cast the President, regardless of his political affiliation, in a positive light – then I would support Thomas’ decision to refuse to participate in a spectacle that clashes with his own political beliefs. If it is not a partisan event, then I would say that Thomas is at fault for turning an apolitical gathering into an opportunity to make a political statement. And for the “separation of politics and hockey” crowd — that flies out the window when you agree to be a backdrop to a speech in an election year. Or any year. In other words, regardless of their personal political viewpoints, NHL players and other athletes who visit the White House are tacitly contributing to a spectacle that, through the positive press afforded the event, advances the political agenda of the current President. A counterargument to this view would be to cast the event as nonpartisan – rather than being hosted by a Democrat President, the Bruins were hosted by the Office of the President. The obvious support for this argument, of course, is the fact that the Bruins would have been invited had a Republican been in the White House – these visits happen regardless of the President, and thus could be seen simply as nonpartisan celebrations of sporting achievements that have no political symbolism beyond the Office of the President recognizing a championship team. I tend to err more on the side of Wyshynski’s argument that attending the White House is an inherently political act; however as I mentioned I tend to read politics into things more than the average person. Nonetheless, I think Wyshynski is right to note that, intentionally or not, the players at these ceremonies serve as a “backdrop” to a political spectacle with partisan implications. I can’t think of many politicians who turn down a photo-op, so even though these ceremonies are seemingly nonpartisan they could certainly be leveraged to provide support for a President with an obvious partisan agenda. This seems particularly likely with Obama, who much like George W. Bush, and many other past Presidents, seemingly uses sports strategically to help craft his Presidential image. While I don’t necessarily agree that Malamud has reached a logical conclusion here, I see his point. 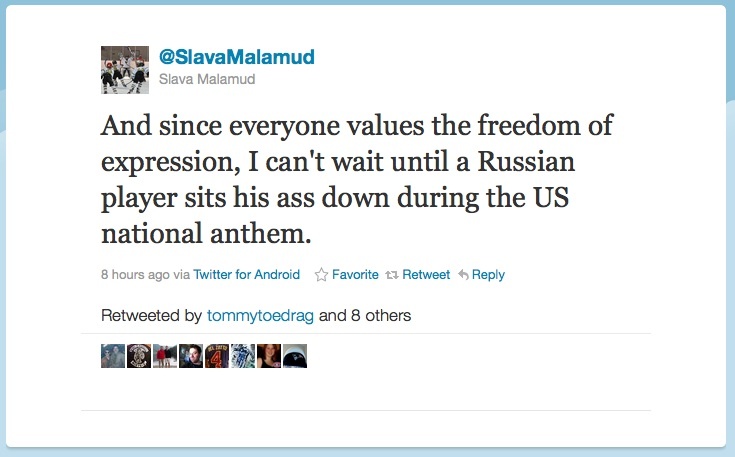 Would those who applaud Thomas for being a “Free Citizen” offer the same platitudes to athletes who used their status to make more subversive political statements? It was admittedly 44 years ago, but the experience of John Carlos and Tommie Smith at the 1968 Olympics would suggest not. More recently, athletes such as Carlos Delgado have drawn flak for making political statements – in Delgado’s case, for not standing for the US national anthem. Heck, the NFL’s Jeremy Shockey even created a mini-controversy by accusing opponents of disrespecting the anthem by not placing their hands over their hearts. The possibility of an ideological and/or partisan double standard for athletes who make political statements is certainly an interesting topic and one that deserves further scrutiny. Based upon this discussion, I suppose my ideal situation would be that the President (or Canadian Prime Minister, who incidentally presently exploits hockey with great skill to further his political agenda) butts out of sports, at least to the degree of staging photo ops with athletes and teams. Make a congratulatory phone call? Sure. Send a nice note of support? Fine by me. But making a public and political spectacle out of athletes and sports teams? That is where I start to get uncomfortable. But given that the White House celebration is, for now at least, a firmly entrenched tradition, my ideal vision will clearly not be realized. And in lieu of that possibility, this becomes a very murky and complicated topic – as proven by the fires of outrage and adoration toward Tim Thomas that are presently raging unabated. I’m curious as to the split on the number of comments your original tweet received. Partisan politics is vicious and a game of overreaction. I would venture a guess that most of Thomas’ detractors are fans of Pres. Obama and/or Democratic party supporters. That being the case I do wonder what they would do in the opposite situation. ie. being forced to shake the hand of someone you do now support. It was mostly a couple of strong disagreements with what I tweeted. I think the gist of the criticism was that I was reading too much into the event, and that the White House visit is apolitcal and should therefore be treated as such by athletes. I stumbled upon this topic randomly and I would have to say, as with much of political discussions nowadays, this delves way too deep into a level of paranoia and uber-suspicion. This has become a world of HYPER-sensitivity to anything that some paranoid person can claim is being used for political purposes. Can’t an American President celebrate an American sport without someone being suspicious. This is nothing new and I doubt it is changing anybodys votes about Obama or any other President. Sure, these jerseys will probably be in Obama’s Presidential library, but its a snapshot of his time in office. If Tim Thomas (or the Nascar drivers who didnt show) dont want to go, then dont. Plenty of former members of teams dont go because they are already on another team. And its not just sports, Presidents celebrate all sorts of acheivements of Americans at the White House. Sports just has the zoom lense on it. Tim Thomas has his rights, but he has obviously taken a special moment away from his teammates who should be honored for their achievement. I think cable news and lack of education is partially to blame, but we have got to get away from this paranoia that there is something behind everything, that there is some scheme behind every moment in politics. Maybe its just a tradition, but to say it should end because people cant come to grips with its utter normalcy (and that politics is too partisan to handle such events) is sad. I agree with you that politics (especially in the US) is becoming ridiculously divisive and, therefore, hypersensitive. Not sure it came through as clearly in my post as it should have, but that is part of why I feel that the White House visits are politicized – because, it seems, anything that the President does could come under attack for helping to advance his agenda (I would have said the same when Bush Jr. was in power; also, I admit that I am not as familiar with US politics as I am with Canadian, so may have an exaggerated view of the contemporary popular/media reaction to Presidential and partisan politics, in which case I am happy to be corrected). That is why I grudgingly support Thomas actions, even I do not feel he handled it in a particularly diplomatic or helpful way (I think, as some writers have pointed out, that it would have been far more productive and made a stronger statement if he HAD attended while still asserting his political viewpoints). Given my politics, I would have more strongly supported, say, Steve Nash if the Suns had won an NBA title under Bush Jr. and he had refused to attend the ceremony in protest against the Iraq War. I do not want to see athletes muzzled politically, nor do I want to see them unable to stand up for political beliefs because they are expected to be good teammates, not rock the boat, and shut up and be grateful that they play a game. I agree, as I mentioned to some people on Twitter, that the event should in theory be a simple, non-partisan event that is a celebration of a great athletic accomplishment. But it seems to me (again, I am open to correction on the extremity of divisiveness is US politics) that in this day and age in the US, any sort of act like this can be construed as partisan. And that is why I wonder if a Presidential ceremony is even a worthwhile event anymore, or if the President should simply offer his/her (one day?) congratulations without holding a (partially media) event. 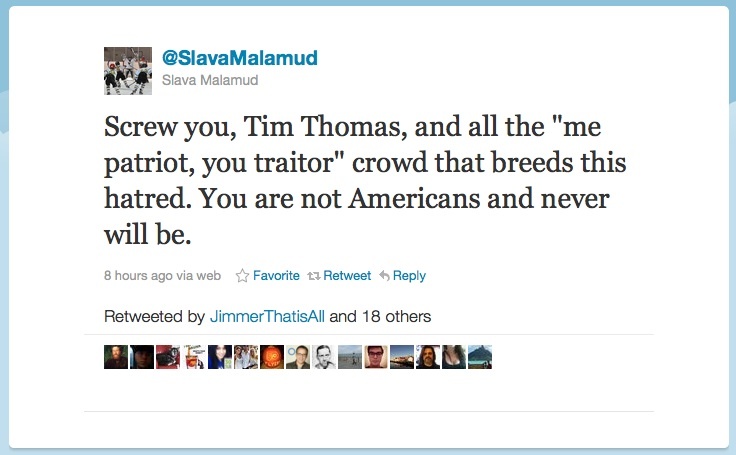 I would also say to claim that Tim Thomas is a “patriot” is insulting to firefighters, cops, soldiers, and any other person who does something good for others in this country. Tim Thomas is a citizen showing his rights which we all do every day. He got the attention his statement was intended to gather. I agree, and I hope that I did not suggest that I think he is a patriot or that you are insinuating that this is what I believe. Words like “hero” and “patriot” are tossed around far too commonly. Thomas made a political statement, and used his platform as a popular athlete to gain publicity for it, but these actions do not make him a better person than any other American. One more thing. Twitter only enforces the rage from both sides. Twitter is not the real world. People need to put down the iphone and walk down the street once and a while and see how meaningless some of the daily twitter mania is. People hide behind their twitter tags and say things they would rarely ever say in public. One thing here can be used to either argue that this ceremony is a political event or is not a political event. The thing I am refering to is Obama’s comment to Marchand. If Obama had actually watched the final, I don’t think he would be asking that question of where Marchand got his nickname from. If he followed the NHL at all this year, again this question would not have been posed. Obama obviously doesn’t watch hockey, so why is he honouring the sport? But I feel that the bottom line is this: the ceremony would have happened regardless who the administration was. The ceremony is as much political as the rules and regulations that candidates must follow in order to gain election. Obama is honouring athletes from a city in the U.S.
Back to Thomas, he loves accepting those giant paycheques from the Bruins, and he is free to live anywhere in the world he wants with those giant sums of money. He of all people is capable of changing his position and yet he doesn’t. He chooses to stay in the U.S. On top of that, his comments were so ill-informed about politics in general, especially making any reference to the political system after saying his actions weren’t political. As an avid Canucks fan (I’m wearing my jersey here at Uvic as I write this), I already had a love-hate relationship with Thomas. He was so good in the final that it’s impossible not to respect the skill, but he gains no admiration from me with his “tire-pumping” comment, abusing/taking advantage of the “don’t touch the goalie” rule, and the fact that he’s an American that plays for the American team that beat out my favourite Canadian team. The event is for the HOCKEY TEAM not Obama. The press covers it because its sports, but there are countless ceremonies honoring people that barely are noticed except for a press release and a White House photograph. Not sure that the CBC are the only ones banging the drum on Harper’s hockey cred. TSN/CTV certainly highlighted his presence at the 2010 Olympics and during the recent WJC. And even though he is not in your face about it, I think Harper has cleverly realized that showing the public his hockey fandom (when he is well known for being guarded about almost all aspects of his personal life) is a shrewd political move to make himself more relatable to the Canadian populace. It’s not a conspiracy – neither by the right to underhandedly use hockey for political gain, nor by the left to wildly accuse Harper of exploiting hockey’s popularity for political gain. Other PMs or politicians of all stripes may similarly use hockey as a political vehicle (don’t forget Jack Layton rocking a Canadiens jersey in a Quebec pub during the last election campaign). However, I think it’s a pretty clear political tactic that has complex intersections with other trends in Canadian society and politics. I’m actually not sure what you mean at the end there. Is “black” aligned with “gang”? I hope that’s not what you meant, but it sure seems that way. I agree with the statement that visiting the white house (unless as a tourist) is always a political statement in and of itself. If, in a fantasy world, I had been invited during the (GW) Bush Administration, I would like to think that I would have politely (but probably not so politely) declined. If athletes are applauded for bringing other issues that they believe are important to the forefront such as gay marriage (for or against), cancer research, or environmental sustainability then why should not Thomas say Thanks, but no thanks to Obama? As much as I despise Tim Thomas as a player, and now evidently for his political convictions, I very much support his choice in not joining the team for this visit. Stop looking at the world through the politico, left/right prism. How can we expect the politicians to put things aside and get things done when we consider attending any event at the white house to be political. That is hyper-partisan rhetoric that serves no purpose other to enflame the extremes on both sides. Apparently Brad Paisley is some pinko commie for playing the White House numerous times during Obamas tenure. Maybe its just an honor to get the invitation and maybe you can respect that there was once a time where people put things aside and just acted like an adult who didnt care about party affiliation. Why are we supposed to be ok with the Hollywood crowd, or the Nashville/ Motown crowd expressing their views publicly? But we express pure shock and hatred when an athlete does it. Or is it because it was ok to bash George Bush and the Republicans, but now its not ok? I think you’re on to something in suggesting that the public does not like its athletes to make political statements. The myth of sports as apolitical is a strong one and athletes who step outside of that mold may be accused of being unpatriotic, ungrateful, a poor teammate, etc. However, I’m not sure where you get the idea that Bush bashing was fine and dandy and Obama bashing is not. The experience of the Dixie Chicks certainly suggests that attacking Bush’s politics could have very severe backlash for celebrities. And there are plenty of popular figures who oppose Obama and receive very little backlash as a result. Everything Tim said is correct. If he strongly disagrees with the actions of the Executive branch (which for the past 12 years he definitely should) That is his decision. 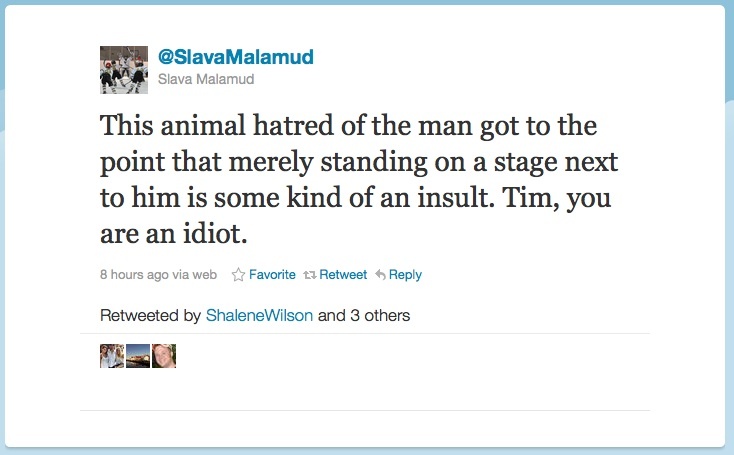 Anyone who knows Tim knows he is a very humble guy and did not intend to make a huge deal out of this. Look at what Obama has actually done in the past 4 years it would piss off anyone who supports civil liberties, peace, and the constitution (which he took an oath to uphold). I may not go as far at to say he’s a patriot, but knowing Tim I would say he loves the USA just not the corrupt people running it. Didnt intend to make a big deal of it? So releasing a letter posted on NHL.com the day of the ceremony isnt making a big deal of it. A simple google search shows that Thomas has expressed his political views and his admiration for Glenn Beck (and he thinks Obama is radical). Lets call it was it is, a selfish grandstanding move that took something away from his teammates who deserved to be honored by the sitting President. I dont think Woodward and Bernstein would have been investigating why he wasnt in the White House photo if he just didnt show up. He expressed his rights, sure, but dont say that he is some humble guy who didnt want to make a big deal of this. What other purpose was there? Did the world need to know where Tim Thomas was when he wasnt on the ice that day? No, but he made sure we all did. Don’t think we can classify this under “the Canucks and Bruins sure do hate each other,” but Vancouver goalie Cory Schneider, a Massachusetts native, did share a few thoughts on Tim Thomas passing up yesterday’s team visit to the White House. “Every person is entitled to their rights, that’s the point of the constitution,” Schneider said, as reported by the Vancouver Sun. “You can have free speech, free religion, politics and all that stuff. So it’s absolutely Tim’s right. His beliefs are his own and that’s fine. It’s just the timing is a little odd. If your entire team is going, it’s about the team to kind of put your own agenda aside and maybe just show up in support. I agree that this is a sensible reaction from Schneider. He seems quite able to separate the President and his politics from the Office of the President. However, while I understand in a hockey sense that this is a team event, I do not agree that players should necessarily submit to the dominant ethos of sport culture by putting aside their political beliefs. Obviously there is a time and a place for this, as well as an effective way to do it (Thomas did not seemingly make his statement as effectively as he could have), and I would hope that an athlete would not take every opportunity to grind a political axe. That would, as with any public figure or friend for that matter, probably make him a pretty insufferable teammate. There was a lot of drama in Thomas’ actions that seems to have contributed to a lot of the backlash he has received. And, I think, given people cause to interpret his act more as a selfish than a principled one. It seems to me the reason this has touched off such a vivid response is that it so exceptional. If it were not for the dominant trend of player who treat these visits as non-political and somewhat rote, Thomas would not stand out. He took a situation that is usually accepted as given and made it into a controversy. The weird thing is how simple and easy it was for him to do so, and it was that simple and easy because hardly anyone ever does it. If more athletes took such stances, the individual ones would not stand out so much. But, then, why should they? They’re famous for their skill, talent and dedication, not their rhetorical skill or political shrewdness. Most know this, and stay in their appointed place. Of course, given the opportunity to speak out against a great ill like racism or homophobia, any citizen has the right to do so. But Libertarian values like Thomas’ (easy to be a Libertarian when you’re also a millionaire, by the way) are not the same. He might have strong and justified opinions, but to symbolically refuse a White House visit because of small government beliefs is to treat a (perceived) molehill of injustice as if it were a mountain. It’s his right to do so, but it’s also my right to say it was obnoxious and in poor form.